Conrad is the first German saint to be canonized after three centuries of Protestantism. Conrad Birndorfer, previously named John, was born in Bavaria in the year 1818. 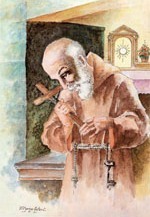 After living devoutly as a young man, he made religious profession in the Order of Friars Minor Capuchin in the year 1842. For 41 years he served as porter of the friary at Altotting distinguishing himself for very great charity, zeal and patience. He was a father to the poor and destitute. Conrad also had a tremendous devotion to the Blessed Mother and instilled this devotion in many others. Just three days after relinquishing his position at the door of the friary, Conrad died April 21, 1894, with a reputation for great holiness. Pope Pius VI beatified him on June 15, 1930 and the same Pope canonized him on May 20, 1934. Merciful God, through the service of Saint Conrad you were pleased to open wide to the faithful the portal of your mercy. May we pursue his spirit of poverty and humility of heart in serving our brothers and sisters. We ask this through our Lord Jesus Christ, your Son, who lives and reigns with you and the Holy Spirit, one God, for ever and ever.